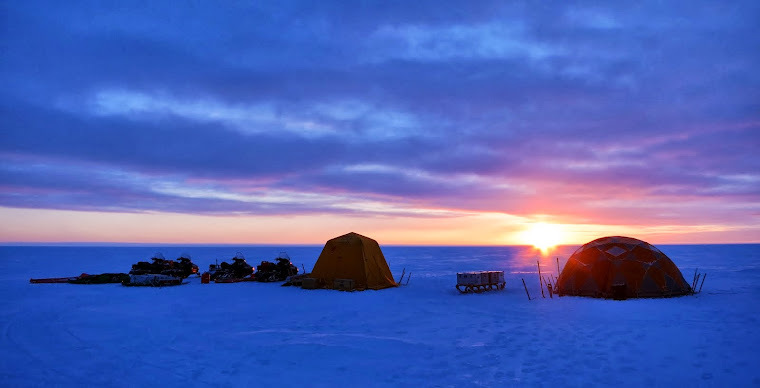 Yesterday the team attempted to reach the old 'PARCA' ice core site, but after 17 km again a snow mobile died... Got it working again but decided to return to camp for safety. Good call! They changed plans and Alex and Horst achieved to retrieve a very nice core with some interesting findings at 2250 m above sea level, which was 31 km up-slope from camp. Meanwhile Mike and Karen also delivered: 30 km of radar measurements towards the former KAN_U camp and the installation of an IMAU automated GPS 'S11'. But that was it. Since then a new storm came in - even worse than the two previous ones. They had to re-secure all tents and build snow walls around them to keep them from flattening by wind force. Today, all four of them are stuck in the tents, sitting it out... They mentioned things were "miserable", but said it while laughing, so they are making the best of it! Today's entertainment is Uno... Tomorrow's 'entertainment' is logger the drilled core, if weather permits.